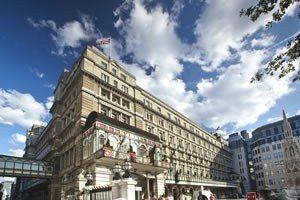 Is your hotel located near Playhouse Theatre? Get in touch now to be listed on this page. The Grade II listed Amba Hotel Charing Cross “combines Victorian Grandeur with boutique design.” The hotel features “The Brasserie”, an AA Rosette award winning restaurant, as well as a lounge that serves afternoon tea and a cocktail bar for guests to indulge themselves in. There is an onsite gym as well as various suites and meeting places available for hire. Standard bedrooms include complimentary WiFi, toiletries, tea and coffee making facilities, iPod docking, in room Air Conditioning and a safe. Rooms with heated floors, heated mirrors, rain showers and lounge areas are also available for those who seek an extra lap of luxury. Call 0800 330 8397 for reservations and further information. Reviewers on TripAdvisor have given Amba Hotel Charing Cross 5 out of 5 stars. 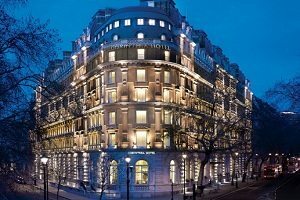 The Corinthia Hotel in Whitehall is a prestigious and luxurious 5 star hotel in one of London’s most regal districts. The hotels elegant façade is similarly reflected in the stylish interior. As well as a luxury pool and spa, the Corinthia Hotel London includes many bars and fine dining areas, including an oyster bar, the traditionally British Northall restaurant and the theatrical Bassoon Bar, which serves bespoke cocktails to thirsty guests! Even the most basic room facilities include complimentary newspapers, Nespresso Coffee machines, LED TVs, an Italian marble En-Suite bathroom with complimentary toiletries, a mini bar and 24hr gym access. Call 020 7930 8181 for reservations and further information. Reviewers on TripAdvisor have given the Corinthia Hotel London 5 out of 5 stars.